Happy hour in the financial district has its own taxonomy. 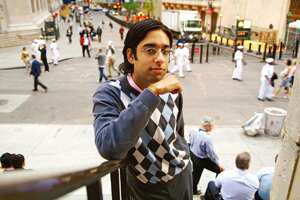 The other night, amid the several sidewalk tables on Stone Street, Amit Chatwani, the 26-year-old behind the satirical Wall Street blog Leveragedsellout.com, broke down the scene within seconds of his arrival. The young woman carrying a canvas “deal bag" with the Goldman Sachs Group Inc. logo was most likely a bank associate, he surmised. The younger-looking man reading the so-counterintuitive-it’s-intuitive business book The Black Swan was an analyst with big-picture dreams. And the rest of the tables were filled with tech support and human resources staff, he figured. “They have to be back-office, because it’s too early for bankers to be out," Chatwani said. “They could be traders, I suppose. Or compliance and risk management, which is basically middle office that’s treated as back office." But Chatwani would be the first to admit that his assessments of the culture of Wall Street are not, at the moment, holding their value. His book, written under the name Leveraged Sell-Out and titled Damn It Feels Good to Be a Banker, was published by Hyperion in August, giving it a fair claim to some kind of Worst Timing Ever Award. “Basically, I’m making fun of a class of people who most of the world still hates, but it’s just not the same to kick them when they’re down," he said. The book is a sort of fake how-to guide to understand and join the realm of young investment bankers, as if written by a young investment banker—Chatwani’s alter ego, Logan, described on the back cover as a 24-year-old financier whose hobbies include mergers and acquisitions, sailing, and “aggressive spending." He said he didn’t think the book was selling as well as he or his publisher had expected. “But I’m kind of hoping that people will look at it as a sort of historical document, a parody of a world that existed until basically a moment after it came out," he said. The book is essentially an explication of elites and elitism, and is about everything that matters to financiers: firms, jobs, schools, women, things you can buy, and money, money, money. Of commercial banks with investment-banking divisions (such as Wachovia Corp. and JPMorgan Chase and Co.), our narrator is dismissive: “It’s like taking a Porsche and attaching a huge Maxima decal to the back windshield—it’s disgusting and wrong." “The hierarchy is now null and void," Chatwani conceded. A characteristic observation in the book, parodying the language of the young hot-rods, concerns banker shoes: “I, personally, like my loafers just like I like my women: expensive, fit, and, more often than not, with a bit of bling around their necks." Chatwani went to Princeton, and after college he got a job with the consulting division of a technology company, but found himself thoroughly immersed in the young Wall Street milieu. He was sharing a TriBeCa apartment with four investment banker friends from college, and there were four more in the apartment directly upstairs. He said he had been “seriously shocked" by the amount of time some of them put in trying to estimate their year-end bonuses, and began writing up short parodies of — and for — their world. “Bankers talk about everything in financey terms," Chatwani said the other night. “The way they talk about girls — a guy will say he’s going to short a girl because, you know, ‘There’s a lot of overvalue here.’ Also, you don’t organize your day, you structure it." He went live with Leveragedsellout in the fall of 2005. By January 2006, the Business Week called him (or rather, his character) “the Borat of Wall Street", and the site was getting 225,000 unique viewers a month. The book deal came a year later. But instead of assuming the mantle of a populist hero, Chatwani these days consoles and counsels his friends through these uncertain times. “A bunch of them are applying to business school," he said. “One guy says that people at his firm are so panicked they just watch TV in the office all day." One of the most trying aspects for them, Chatwani explained, was the loss of “perceived prestige" with women. “A lot of my dude friends when they meet a girl in a bar, they’ve stopped talking for once about what they do," he said. “If you tell a girl you work at an investment bank, that gets you a sympathetic pat on the back. That’s not the response you’re looking for."